Add a USB port to any lamp with a light bulb socket adapter. Screw it into a standard household lamp (or an exterior light) to have a rapid charging port right where you want one—without taking up any outlet space. The adapter does its smartphone and tablet charging job when the light is off, too. Dimensions: 2.7" x 2.6" x 2.7"
This works great because it is so convenient. My only comment is I had to buy a “longer” lampshade to get it “covered”. Great buy! 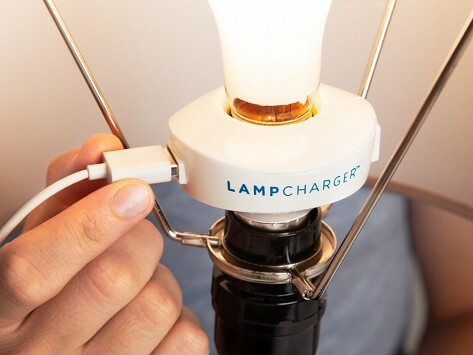 LampCharger is a light bulb socket adapter that combines two bright must-haves in one. It screws onto just about any household lamp (between the socket and the bulb) and provides a USB power source for devices like a smartphone or a tablet. The rapid 2 AMP charger does its job even when the light is turned off, so you can power-up around the clock. It’s the perfect addition to a bedside lamp or one within reach of the couch. And it won’t take up any valuable outlet space. LampCharger works on outdoor lights, too, so you can have easy access to a USB port where you need one.